I have been asked to think about what kind of planters can be put in a vast parking lot. 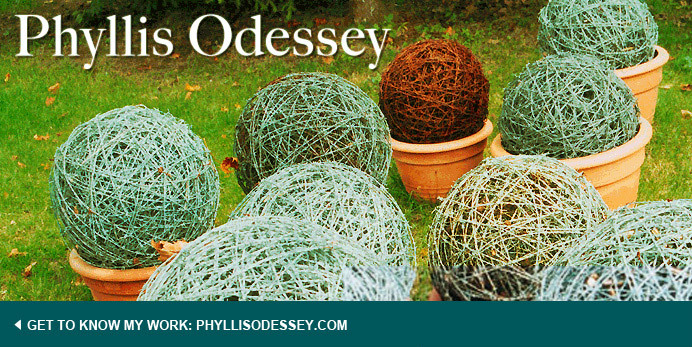 To solve this kind of problem, I look for an artistic solution rather than a horticultural one. This is a really interesting project from Toronto. 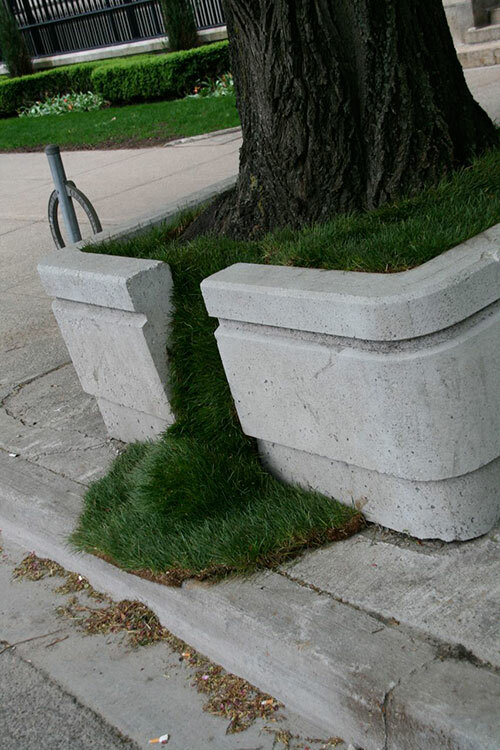 Through creative interventions, this project highlights some of the neglected city tree planter boxes that line our busy streets. These planters are generally made of concrete and many are cracked or missing large chunks (see gallery images). Others have been replaced with standardized two-piece boxes. However, some of these are too small for the existing mature trees and their roots, leaving huge gap between the two sides. More still contain only stumps, or have become garbage bins with little to no vegetation at all. To be clear, this project is not about pointing fingers. In areas of major or ongoing roadwork, planters have removed or changed by the city. Others are just being replaced here and there as previously mentioned. 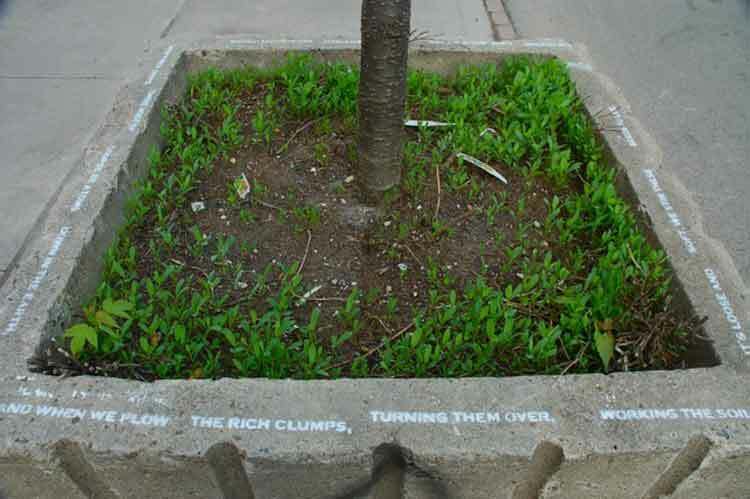 In select neighbourhoods, street planters are well maintained by BIAs, businesses and/or residents. This project works primarily with those currently in poor condition. We all have stakes in our shared environments, and this public project directly engages with Toronto’s urban fabric. 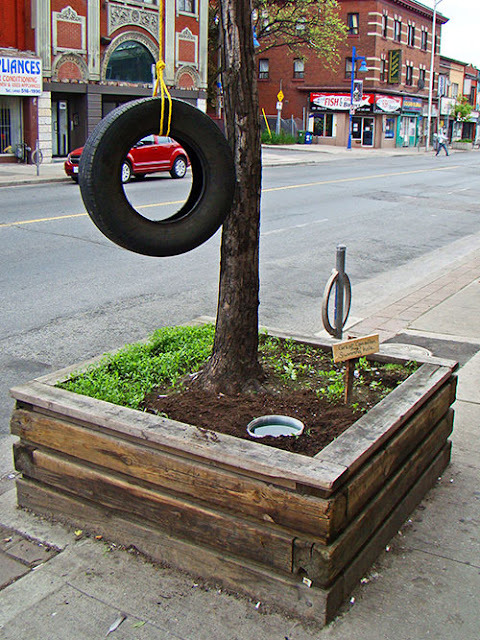 One of the primary intents of the Outside the Planter Boxes project is to encourage more direct participation and interest in our shared public spaces – to demonstrate that the public can play a more consciously active role in how our city is shaped. 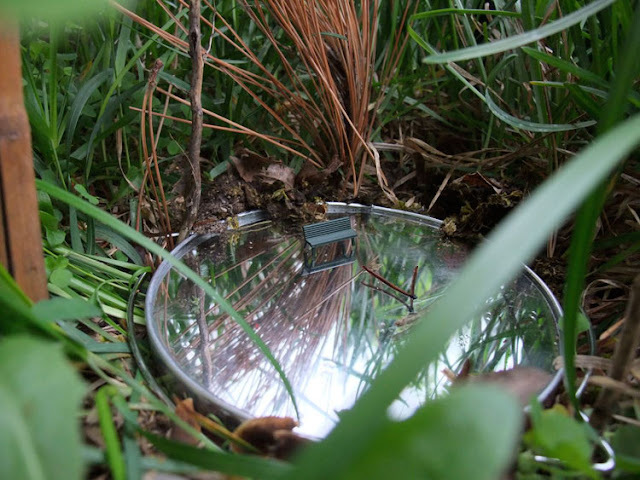 Hopefully you will find the project reveals possibilities for alternatives and perhaps more biodiversity, creative gestures, and better city infrastructure. I first had the idea for some of these interventions more than two years ago, but put it on the back-burner. However, this January 2011, I was fortunate enough to be awarded the first Toronto FEAST Project Grant to help support the endeavor. FEAST is an independently organized funding event series new to Toronto (originally launched in Brooklyn) whereby presenters and others in the community attend and vote for the project they would most like to see realized. The first proved fun and rewarding, and it was interesting just to hear everyone’s ideas. 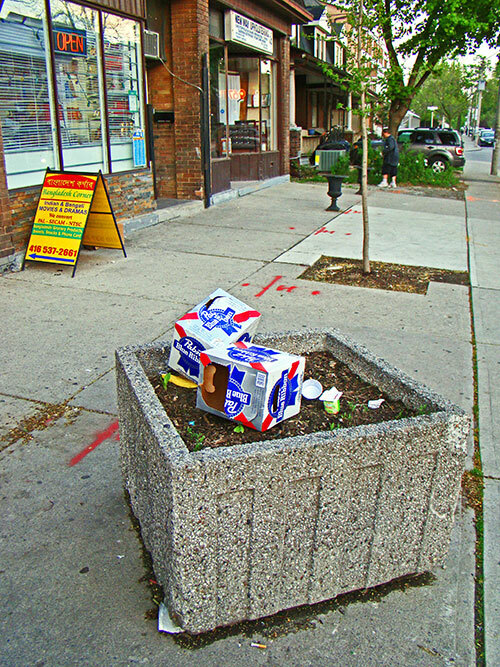 My original proposal was to realize some of the planter projects I had previously conceived, but I later decided to expand the project by inviting others to simultaneously create unique planter interventions of their own around the city. My call was fairly open and I suggested the interventions could take on any number of forms – from conspicuous (and perhaps only temporary) repairs, to straightforward weeding and planting, to sculptural additions or performance. I only asked that participants use their own best judgment and please not cause any major permanent damage, create physically dangerous structures/situations, or introduce invasive or otherwise harmful species. As you can see on this site, participants came through with fantastic results. One artist, Bentley Ball, did not even know about the project until he saw some of the installations taking place in his own neighbourhood. 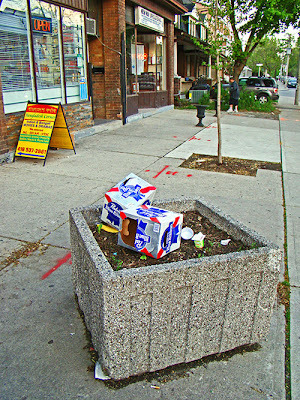 After speaking with another participant, he took it upon himself to join-in and created two wonderful planter interventions of his own on the same street the next day. We’re all very happy he did, and think his initiative is a great demonstration of how such projects can expand, and lead to greater engagement within our shared urban environments. 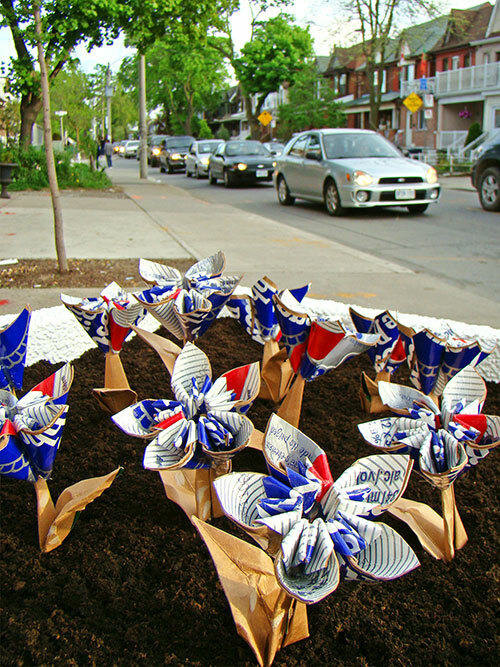 17 Toronto based artists, designers, gardeners and urbanites within a 24-hour period between Saturday May 20th and Sunday May 21st, 2011. Thank you again to everyone who took part, helped, and supported this project. It wouldn’t have been the same without you.